I just logged in and noticed that today one of the most common search terms for people landing here was on information for trains between Delhi and Shimla. So i decided to do a small write up on it while my wife waded through something called Melrose Place , a Tv show from the early 1990’s which became quite popular and featured a story line very similar to Beverly hills 90210 , which i guess half the word has heard about! Coming back to the subject at hand – There is no direct train to Shimla from Delhi. The journey needs to be broken up, whether one likes it or not. There are lots of trains from Delhi to Shimla , but none is more convenient than the Shatabdi. The Shatabdi leaves at around 730 AM in the morning, hit Chandigarh at 1045 or so and then Kalka at 1130. Kalka being the start of the hills. The broad gauge track ends here – 2 options from this point – Road or the Toy Train. Numerous cabs are parked outside the station at Kalka , but they are expensive , anything between 1500-2000 is normal. You can also catch a bus which would be cheap but crowded and longer, time wise. Before i forget , the shatabdi costs around 550 per head one way in the chaircar. They serve meals on the train which are included in the fare , as well as some amount of snacks, water, juices. The important stops are Soniapt , Panipat, Karnal (halfway point) , Ambala , Chandigarh and finally Kalka. The other option is the toy train , now please note THIS IS THE SLOWEST WAY TO GET TO SHIMLA. The toy train takes close to 6 hours to get there, It has multiple stops along the way and the average speed is slower than an truck loaded with 40 tons of apples. But its definetely an experience and a very scenic ride… as long as you have the time. The train stops at the heart of Shimla , just below the mall. Its reasonable and the last time i travelled , around 2 years ago, the ticket was around 150. The train does have compartments i.e 1st class , 2nd class etc etc, but theres not too much difference. Just be careful… The train leaves dot on time from every station, so if you are told that xyz is a 4 minute stop, it wouldbe advisable to treat it as 2. The starting point for the T-Train is the same station where ther Shatabdi finishes its journey. What i am not aware of is the current situation with respect to it. About a month ago , due to torrential rains one of the stations along the line was wiped out – I am not aware of the exact situation now , i can find out if any of you really need the info though..but only if its very important. I have attached this timetable as of the latest info i.e 21stJune 2o09. FC, SC, CC means – first class, second class and chair car. New Delhi to Kalka on AC Chaircar (Kalka Shatabdi) is at 465 INR and First AC at 885. Hi. Ok This will be very brief (yet informative..dont worry!). Listing a few hotels available within main Shimla itself which are excellent choices if you are not in a position to live at the outskirts. All reveiws are based on actual interaction with the property with respect to all its areas of function. If you are here then you are about 10 minutes WALKING distance from the mall. Right in the centre of town and you have access to most tourist spots. The exact network of roads which run around this property also house the Chief Minister’s Official residence and are sealed roads i.e only cars with special permission are allowed to ply , hence walking is unrestricted and not inconvenient. Originally a British Raj Palace it is now , if i remember correctly, with the heritage group of Hotels , an established chain in India. Slightly on the expensive side but an experience in itself. Close to 28 rooms with all modern facilities and amenities. The grounds are on the smaller side but beautiful and green nevertheless. Tennis and Badminton courts. On the other side i.e opp the direction to the Mall is an area called Chotta Shimla. It is essentially a small market offering lots of small places to eat and shops catering to daily needs. Its a sharp walk downhill , and where the market finishes the residential area begins with a colony called Brokhurst which houses Bungalows set between thick greenery and massive deodar trees. Well worth the walk which will be about 40 minutes , round trip. For those who have reached this directly please look at my earlier post titled Shimla – PArt 1 to get clarity on what i am writing about. For those who are coming from that post read on..! All reviews are based on personal interaction with the property and its various aspects. The following are resorts which are found on the other side of Shimla i.e driving stright through the town towards Mashobra and Kufri. 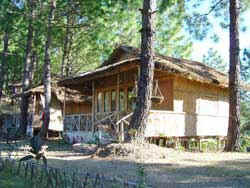 If you are reading this then you have just discovered one of the best properties in Shimla and its surrounding regions. A relatively recent property it is located at a 45 minute drive from the main town. Post crossing the village of Sanjauli , the drive carries on through a back-road taking you right into the heart of the reserve forests , past the Naldehra Golf Course and onto the Chalets. This place scores high on everything , the architechture, accommodation , food , staff , location , facilites and activities . 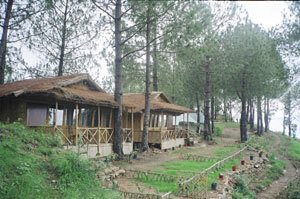 The resort comprises of cottages , apartments and Suites spread over an acre of pristine forest land. The resort offers facilities such as a Billiards table, swimming pool, Spa and jacuzi , Bar and a children activity centre. Host of activities and games available including but not limited to – Bonfires, Barbeques, Cultural evenings, cards, croquet , a putting green and many more. There are numerous walks and treks available. This side in General is very low with respect to polulation density and the fact that it is reserve forest land makes it absolutely breath taking. Is close to the Catchment area which is accessibly by advance permisson from the government and Kufri , another hot tourist destination- but if you dont enjoy the smell of horses and rubbing shoulders with tons of people skip it. I consider myself lucky to have been born and brought up for a large duration of my life in Shimla. For most, a frequented holiday spot, a sought after tourist destination , a place to get away from it all , for me home. All my reviews are based on personal interaction with the property and its various aspects. There is a fair amount of criticism on Shimla now. Overcrowding , traffic is a mess , too much development and other typical tourist problems which crop up such as lack of accommodation at times , over charging etc etc. But despite this it still remains as tempting as it ever was. Most people, when they think of the place, tend to think of the Mall , roughly about a . 6 km walk on a slight incline with shops bustling on one side. Off roads from the mall are the ridge (excellent views) , lower Bazaar (the less fancy day to day item shops , wholesalers) and the tibetian bazaar ( on the ridge). As a result anyone and everyone who stops in Shimla finds him or herself and take about a 100,000 such people with families and cars and the overcrowding problem “why” is solved. While the Mall is a must see the actual beauty of the place has always been towards the outskirts. Most superficial tourists are content with the Mall and the bars and few photos with the monkeys and holding hands and thats it , but many a times have i had to console a genuine traveller on the “charm” factor.